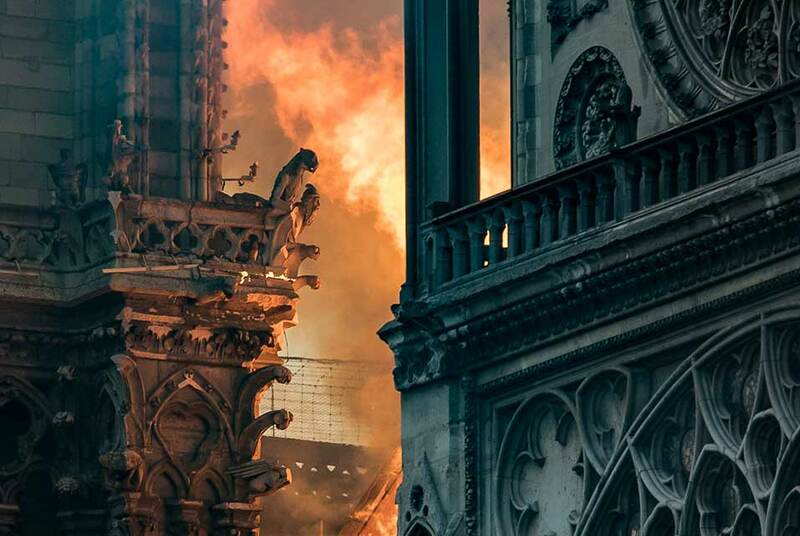 A huge fire swept through the roof of the famed Notre-Dame Cathedral in central Paris on April 15, 2019, sending flames and huge clouds of grey smoke billowing into the sky. The flames and smoke plumed from the spire and roof of the gothic cathedral, visited by millions of people a year. A spokesman for the cathedral told AFP that the wooden structure supporting the roof was being gutted by the blaze. THOMAS SAMSON / AFP. PARIS (AFP).- Crowds of stunned Parisians and tourists -- some crying, others offering prayers -- watched in horror in central Paris on Monday night as firefighters struggled for hours to extinguish the flames engulfing the Notre-Dame Cathedral.